The Tennis Recruiting Network has posted recaps of the 12s and 14s USTA National Championships the past two days, and today the 16s articles have been posted. Links to these recaps can be found here. My summary of Lukas Greif's second consecutive 16s National Championship can be found here. The USTA announced the participants for the third American Collegiate Invitational, which takes place Thursday, Friday and Saturday of the second week of the US Open. Invitations are based on ATP and ITA rankings, with at least two of the competitors needing to have exhausted their college eligibility to comply with NCAA rules. The winners of the eight-player fields receive either a qualifying wild card or a main draw wild card for the following year's US Open. Last year the ranking necessary to receive a main draw wild card was 120; this year's ranking is more obtainable, with the men's winner needing an ATP ranking of 250, the women's winner, 150. [CORRECTION: The USTA made an error in the release, the main draw wild card criteria is unfortunately the same as last year, 120]. The winners also receive wild cards into two USTA Pro Circuit events, while the finalist will receive one. As in the past two years, the tournament will use the regular, best-of-three-tiebreak-sets scoring format. 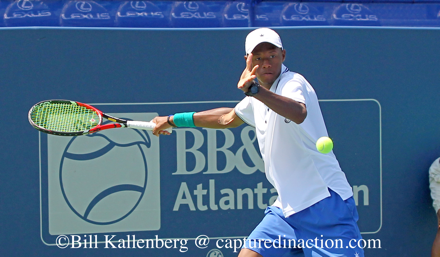 Eubanks also has received a US Open men's qualifying wild card, with Mitchell Krueger, who was in the USTA release as a qualifying wild card, moving into qualifying on his own ranking. Admission to the US Open grounds is free on September 8, 2016, and fans can watch all eight collegiate matches as well as the junior championships and men's and women's doubles semifinals. For more on all the new courts and amenities at the US Open, see this release. Steve Johnson defeated No. 7 seed Jo-Wilfried Tsonga of France 6-3, 7-6(5), coming from 6-3 down in the second set tiebreaker to reach the quarterfinals of the Western & Southern Open in Cincinnati, Johnson's first ATP Masters quarterfinal. With the win, Johnson also moved past John Isner, who lost Wednesday, to become the top-ranked American. On Friday, the two-time NCAA singles champion plays unseeded Grigor Dimitrov of Bulgaria, whom he beat in the third round of Wimbledon last month. For more on Johnson's win and move to US No. 1, see this article from the Cincinnati Enquirer. The US Open National Playoffs begin Friday at the Connecticut Open in New Haven, with 16 singles matches. The draws have been released, with Ayaka Okuna of Japan the No. 1 seed in the 16-player women's draw, with Sanaz Marand No. 2. Okuna lost to Oklahoma State's Kelsey Laurente in the Northern sectional final, but with only 15 sectional tournaments, there is a need for one finalist to fill the draw. The men's "extra" also went to the Northern finalist, Evan King, who is seeded second in the men's draw. He lost in the Northern final to Nick Meister, who is the No. 1 seed. Gage Brymer, the Northern California finalist, take over the spot of winner (and UCLA teammate) Logan Staggs, while Ena Shibahara is apparently concentrating on the main draw doubles wild card she earned in San Diego and will not play in Connecticut, with Magda Okruashvili of Georgia, the Intermountain finalist, taking her place in the singles draw. The winners of the singles tournaments in New Haven receive a qualifying wild card into the US Open. The doubles and mixed doubles winners are awarded US Open main draw wild cards. For more about each player, see this release. The order of play for the US Open National Playoffs is included in the WTA Connecticut Open schedule. Julia Elbaba's name appears twice, as the recent Virginia graduate received a qualifying wild card into the WTA event and is participating in the USONP as the Eastern sectional winner, so she will play two matches Friday. Other young Americans receiving qualifying wild cards into the WTA event are Elbaba's teammate Danielle Collins, Sonya Kenin, Kayla Day, Lauren Davis, and Duke's Ellyse Hamlin, a resident of Fairfield, Connecticut.